The unprecedented amount of gold unearthed during the California Gold Rush sparked a boom in mining throughout the world. From 1850 through 1875, more gold was discovered than in the previous 350 years, upsetting monetary systems everywhere. Almost immediately, the flood of newly mined metal distorted the existing ratio between gold and silver prices. As more gold became available, silver prices rose dramatically, and the bullion values of United States silver coins quickly exceeded their face values. Virtually overnight, the nation's supply of half dimes, dimes, quarters and half dollars vanished from circulation. Bullion brokers, speculators and ordinary citizens plunged into frantic hoarding, followed by the export and melting of vast quantities of silver coins. Nothing was left but the tiny "fish scales," silver three-cent pieces struck in a debased .750 fine alloy and therefore virtually "meltproof," even at advanced silver prices. U.S. Mint Director George N. Eckert came up with an immediate and easily implemented solution. He obtained authorization from a sympathetic Congress to reduce the weight of the half dime, dime, quarter and half dollar, while keeping the existing fineness, sizes and designs. The Act of February 21, 1853 directed that the new coins would have the same color and wearing properties as the older issues, and the weight reduction would be relatively minor. The half dollar would go from 206.25 grains (13.36 grams) to 192 grains (12.44 grams). 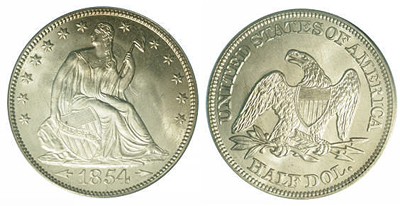 Half dollars minted before 1853 were of the Christian Gobrecht designed Seated Liberty type. They had been in production for over a decade, and the public was quite used to seeing Liberty seated on a rock and an eagle with outstretched wings. Eckert felt a need to provide some visible symbols by which the new coins could be distinguished. After all, if silver prices fell and the old standard was resumed, the lighter weight coins might be withdrawn. If the lighter standard became permanent, older coins without the distinctive mark might be easily culled out by banks, Treasury offices and other coin-handling centers. The first lighter weight coins released in 1853 featured arrowheads flanking the date on the obverse and a glory of rays surrounding the eagle on the reverse. This combination was highly visible, but the rays complicated the die makers' work and slowed die production to an unacceptable degree. Dies with the rays also failed much more quickly that the older design, requiring endless preparation of more replacements. For 1854, the rays were deleted from the quarter and half dollar, creating the Arrows type. This design was struck in 1854 at Philadelphia (no mintmark) and New Orleans (O). In 1855, San Francisco (S) augmented the production of the other two mints. Mintmarks can be found on the reverse, beneath the eagle. A small but unrecorded number of proofs of both years exist. Perhaps as many as 20 pieces survive of the 1854 coinage, while proofs of 1855 are rarer still, with about a dozen pieces known today. The late Walter Breen recorded three "Branch Mint Proofs" of the 1855-S half, which he believed were struck to celebrate the beginning of silver coinage in San Francisco. One of these, given by San Francisco Mint Superintendent Robert Birdsall to Mint Director James Ross Snowden, later became part of the National Collection at the Smithsonian. The entire question of branch mint proofs is still an area of spirited debate, even among veteran collectors and students of America's 19th century proof coinage. Close study of this short series reveals a host of minor varieties. Collecting this design by variety has few adherents, however, in spite of research available since the 1930s. M.L. Beistle first attempted a listing in his 1929 Register of Half Dollars Die Varieties and Sub-Varieties. More recently, his work was supplanted by Walter Breen's Complete Encyclopedia and the Randy Wiley-Bill Bugert Complete Guide to Liberty Seated Half Dollars. Today, after many years of neglect, collectors are rediscovering the Seated Liberty coinage, partly through the efforts of the Liberty Seated Collectors Club and its publication, The Gobrecht Journal. The series contains only five date and mint combinations, but the rarity of the 1855-S, particularly in high grade, prevents most collectors from completing a set of this design. Generally, Arrows halves are sought as type coins, with the New Orleans issues more readily available in mint state than the Philadelphia coins. Also popular with collectors, but quite elusive in all grades, is the only overdate in the series, the 1855/54 Philadelphia issue discovered by Walter Breen in 1970. Although high-end, mint state Arrows coins exist in large enough quantities to satisfy collector demand, the same cannot be said for proofs. Unfortunately, 19th century collectors did not regard these coins with the same respect shown by their successors, and handling marks and hairlines are the rule rather than the exception for proofs of this type. When grading this design, or any Seated Liberty half, wear will first show on Liberty's head, breast and knees. On the reverse, check the eagle's head, neck and wing-tops. Slightly less than 12.8 million Arrows halves were made in the two years, and they served their purpose well, remaining in circulation long after falling silver prices allowed discontinuation of the identifying arrows. They were in daily use throughout the 19th century and could still be found in the rural South as late as the 1940s. The coins were a major annoyance to dealers active in the early 1900s, thanks to the kind of inaccurate stories in popular newspapers that have always been a plague to informed numismatists. Cantankerous New York dealer Thomas L. Elder went as far as specifying the Arrows silver in a list of coins he would not buy in his ads in the city's newspapers. Elder stressed that "nickels without CENTS on the reverse, and silver coins with Arrows at the date command no premium whatsoever," and forcefully suggested that their proud owners spend them at face value! Toward the end of 1855, Mint Director Snowden realized that few of the old standard silver coins were still circulating, and he ordered the removal of the arrows for 1856 coinage. The original 1839 Seated Liberty design resumed until 1866, when the motto IN GOD WE TRUST was added. BIBLIOGRAPHY: Alexander, David T., DeLorey, Thomas K. and Reed, P. Bradley, Coin World Comprehensive Catalog and Encyclopedia of United States Coins, World Almanac-Pharos Books, New York, 1990. Beistle, M.L., A Register of Half Dollar Die Varieties and Sub-Varieties, Beistle Co., Shippensburg, PA, 1929. Breen, Walter, A Coiner's Caviar, Encyclopedia of United States and Colonial Proof Coins, 1722-1989, Bowers & Merena, Wolfeboro, NH, 1989. Breen, Walter, Walter Breen's Complete Encyclopedia of U.S. and Colonial Coins, F.C.I. Press/Doubleday, New York, 1988. Taxay, Don, The U.S. Mint and Coinage, Arco Publishing Co., New York, 1966. Wiley, Randy and Bugert, Bill, The Complete Guide to Liberty Seated Half Dollars, DLRC Press,Virginia Beach, VA, 1993.